You are currently browsing the Western Custom blog archives for November, 2009. Remember those innocent childhood days before there were video games, VCRs, DVD’s, iPods, and even computers? A game of marbles, puzzles, or jacks provided fun and entertainment in simpler times. One thing that remains a problem today is the cluttered desk. Even with the digital age, we are still being overwhelmed with bills and paperwork. What better way to keep this in control than a Giant Cast Iron Jack Paperweight. 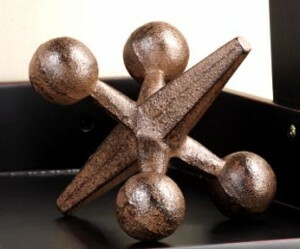 Reminiscent of the childhood game, this makes an eye-catching and useful conversation piece. Maybe just the right touch to bring interest to your decor. With the Holidays approaching, thoughts turn to family and good times. Warm wishes prevail even in difficult times. Wines provide an elegant toast and compliment to holiday dinners. 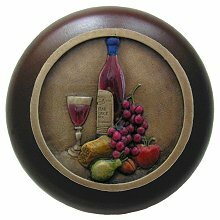 A great compliment to wine cabinets and home bar decor, is a fine, expressive cabinet knob. Solid Wood and Pewter Cabinet Knobs in a variety of finishes, add an air of distinction similar to the sampling of a fine vintage wine. Dress up your home for the Holidays with expressive cabinet hardware. With the Holiday Season approaching, Night Lights can make a great gifts. Nite-Lites, as they are sometimes referred to, come in a vast variety of shapes, sizes, and themes. Gently casting an ambient glow, these beacons provide soothing assistance in alleviating a child’s night terrors; and provide a degree of safety for adults, when having to get out of bed at night. 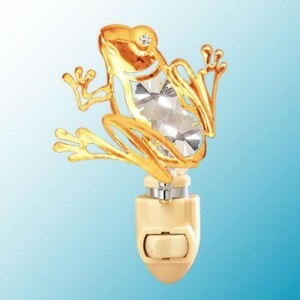 Austrian Crystal Night Lights are a beautiful, and decorative option. These are eye-catching in the daytime as well.